How do I get my benefits with the eWIC Card? Clinic staff will issue your food items the same as before. Your benefits for each month will be in your account on the beginning date. As you purchase your approved foods, your account balance will decrease. Benefits will be in your EBT account at 12:00 midnight on the beginning date and will expire at 12:00 midnight on the ending date. A PIN is a four-digit secret number that allows only you to use your eWIC card. Do not tell your PIN to anyone that you have not authorized to use your card. If someone knows your PIN and they use your card to get your food benefits without your permission, those benefits will not be replaced. You also should not write your PIN on your card or any place where someone could find it, such as your wallet or purse. If you forget your PIN, contact your WIC clinic. When you choose a PIN, you should choose four numbers that are easy for you to remember, but hard for someone else to figure out (for example, your child’s or parent’s birthday). If you are having trouble remembering your PIN, DO NOT try to guess your PIN when entering it on a POS terminal. If you have not entered the correct PIN by the 4th try, your account will be locked to protect it from someone guessing your PIN and using your food benefits. You will have to wait until after midnight for your account to unlock to try again. If someone has your PIN that should not have it, immediately contact your WIC clinic to change your PIN. How will I know my food account balance? The easiest way to know your account balance is to keep your receipts. If you don’t have your last receipt, you can check your balance in the EBT card reader at the clinic or the store. You should always check the amount of approved foods remaining before you shop. What happens if the POS machine is not working? Another POS machine should be tried or you can go to another participating store. Contact your WIC clinic. You may have to get a replacement card. If your eWIC card is lost or stolen, contact your WIC clinic and they will issue a replacement card. Save your eWIC card! Even when your WIC foods are used, your eWIC card is reusable. 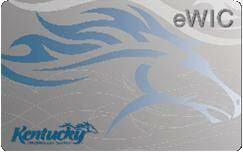 Your next benefits will be accessed with your eWIC card. If there is an EBT card reader, check your balance before shopping. Slide your card and enter your PIN to get your balance. Buy what you need. You do not have to buy all your foods at one time. If your benefits include dry or can beans/peas, you can buy either a 16 ounce bag or 4-16 ounce cans of canned beans/peas. All 4 cans do not have to be purchased at one time, but once you start buying cans, your remaining balance for that quantity will be for cans so dried beans cannot be purchased from that portion of the remaining balance. Have your WIC EBT card ready. BEFORE scanning of any foods, tell the store cashier you are using a WIC EBT card. When the cashier tells you, slide your card in the WIC EBT card reader or hand your eWIC card to the cashier. The food items and dollar value of fresh fruits and vegetables you purchase will be deducted from your account. Only the exact amount of your approved food purchase is deducted from your WIC benefit account. The clerk will give you a receipt. This receipt will show the amounts and quantities (if any) of WIC foods still left in your account. Even when all your foods are gone, don’t throw your card away. Keep your card away from magnets and electronic equipment, such as TVs, radios, VCRs, microwaves, cell phones, etc. Do not place your card in direct sunlight, such as on your car’s dashboard. Contact your local WIC site or the Kentucky WIC Help desk at 1-877-597-0367 option one with questions. For support with the WICShopper app, email wicshopper.support@jpma.com.